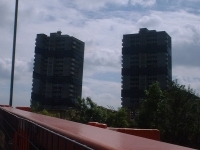 On Sunday August 11 2002, two tower blocks in Leyton (East London) were blown up. 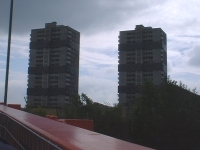 Hornbeam and Redwood towers stood on the corner of Cathall Road and Hollydown Road and they were the last of their type to be demolished in the area. 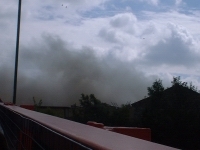 Video footage of the demolition is available thanks to Paul Kingham and Trevor Clarke - choose between Mpeg (3Mb) and WMA (300k) formats. A BBC News article about this is online here, and an article in The Times is available here (needs free membership). 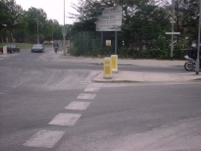 Warnings were placed in the tube station and by St Patrick's Cemetery. A last glimpse of the towers. People climbed on vehicles to get a better view. 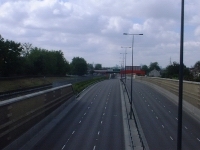 The M11 link road and tube line fell silent, and sirens sounded. 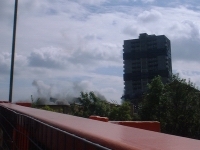 A bang, and the first tower began to crumble. As the first tower came down, the second one began to fall. The towers were down after just 9 seconds. 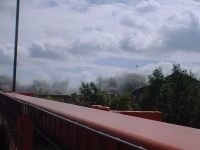 A dust cloud rose up from the rubble. 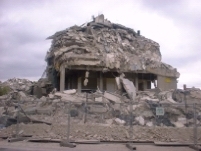 Later, the towers had become two mounds of concrete debris. Dust had fallen on the road like ash, or a sprinkling of snow. 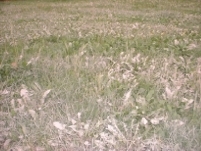 The lush green grass nearby was also coated in dust. 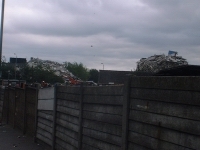 Afterwards, the remains of each tower looked like a bombsite from a news report.